The Paris terrorist attacks in November 2015 were the deadliest in European Union since the train bombings in Madrid in 2004. Yesterday I pondered on the frivolousness of fashion, but how being culturally aware, usually, enhanced your work. Designers have been trying to restore Paris’ liveliness, a quality it tragically lost following the attacks. Resilience and solidarity, the French way - designers from Olivier Rousteing to Walter van Beirendonck to Karl Lagerfeld, amongst others, all felt the influence in their collections. 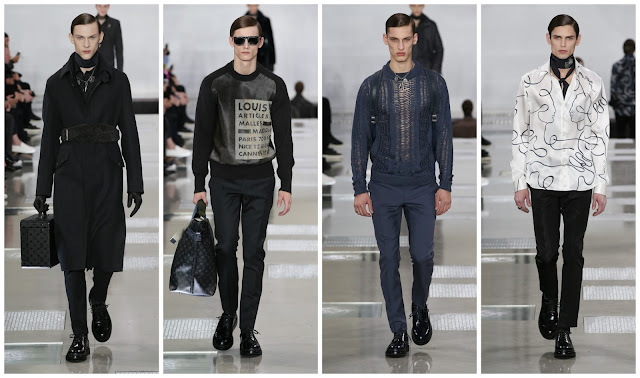 Kim Jones, at Louis Vuitton, began planning his newest collection halfway through last year, post-Charlie Hebdo massacre. There was a stark juxtaposition in his Fall 2016 menswear collection. The clothes were all, seasonally, in darker hues, varying greys, navy, black, taupe, army green. The setting, an all white cuboid, equipped with a fluctuating ceiling fixture by Japanese artist Shinki Ohmaki. “This season I was inspired by Paris - old and new,” Jones said in his show notes. This ranged from the Art Deco period in the 1920s, to the city present day, still recovering but soldiering on from recent events. 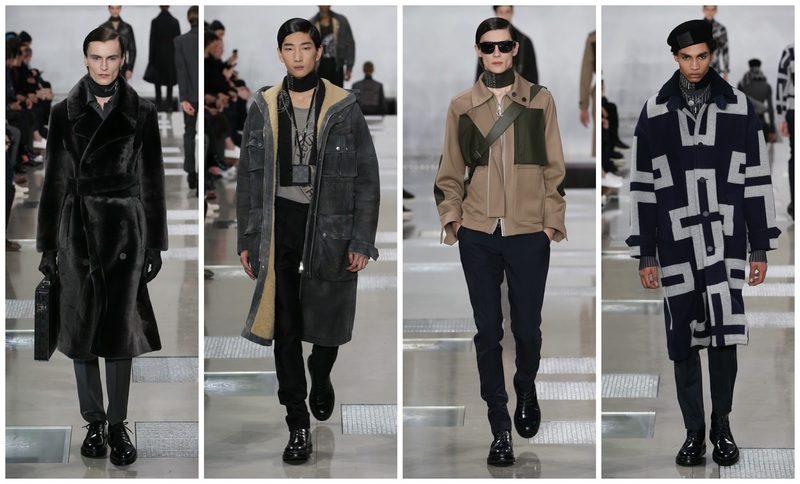 The models, all young men with hollowed cheekbones, wore clothes with a militaristic touch. There were military berets and army green hues. Subtle, yet pertinent given the French military strikes carried out against ISIS over the past few months. Referencing the house codes, 'Volez, Voguez, Voyagez’, which translates to ‘fly, sail, travel,’ one navy two piece was emblazoned with the line. The nicest pair of pyjamas in recent time, no? The line is also plugs the exhibition ongoing at the Grand Palais (the exhibition closes February 21). As well as referencing the codes, Jones toyed with them. Monogram Eclipse, it is entitled, comes in grey and black and is “inspired by the black leather on the famous Malle Courrier in the Louis Vuitton archives.” Similarly, Nicolas Ghesquière (and his predecessor, Marc Jacobs) have been challenging the image we have of the Louis Vuitton logo. As a luxury brand, this is a brave move. The clothes, presented to a star studded front row (including Lewis Hamilton, Michael B Jordan and Nick Robinson), were the age old perfect combination of simplicity and effectivity. There was brilliant suits (one stood out in particular, in a graphite grey), trench coats, and distressed jackets. A diagonal motif running through the collection was sublime. There was a thick scarf, a bomber jacket in French navy and grey and a similar coat. It was a sober affair at Louis Vuitton for the menswear season. Comparatively speaking, the womenswear collection focused on the positives of our times: technological advancements, childhood preoccupations, etc. Kim Jones turn for menswear, usually heavily inspired by extravagant, far-flung locations looked closer to home, their front doorstep: the City of Light. The clothes were dark, but the light poured in. That’s how it should be.